A slim lightweight silver venetian box chain. This Italian beauty is available at an unbeatable price. Box chains show a lot of surface area so you get a flashy look on even fine chains like this one. 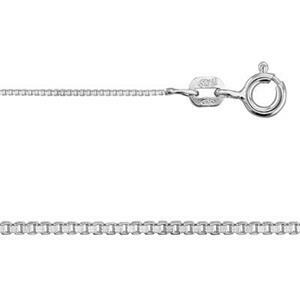 The small diameter makes this chain best for lightweight charms. Looks great in layers with other chain styles for a varied, textured look. Nice box chain & good quality. Delicate look but sturdy to wear. Works well with my light pendants.